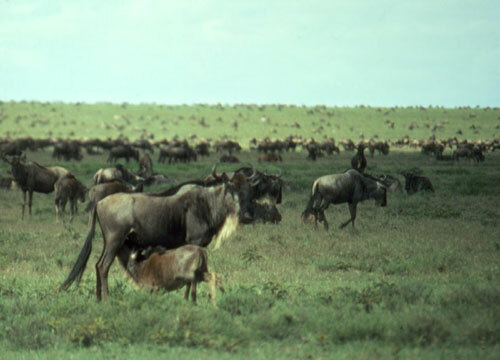 Wildebeest pause their annual trekking to feed on the short grass plains in south-eastern Serengeti which provide minerals for their growing calves. 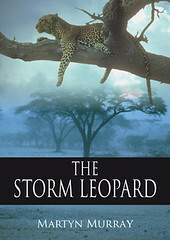 A BBC documentary on the Serengeti National Park (available here until midnight 30 June 2011) pitches a now familiar story. 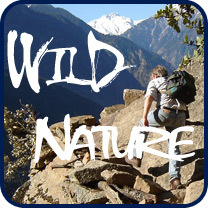 National Parks were created by Western minded naturalists without regard for the traditional rights of local people. In the case of the Serengeti, those local people were pastoralists who had been living harmoniously alongside wildlife; without them the park would not have survived in its present form, indeed could not even have existed as we see it today. For without cattle and fire, we are told, the Serengeti grasslands will return to dense thicket and woodland. Those thickets might support a few browsing animals, like impala and giraffe (actually bushbuck and lesser kudu would be better choices), but not the wide variety of animals we see today. It is thanks to the pastoralist and their cattle, the experts inform us, that we have grasslands in the Serengeti and thanks to the grasslands that we have migratory wildebeest, zebra and gazelles, and the big cats that stalk them. We owe our enjoyment of Serengeti’s rich mixture of woodlands and grasslands – that gloriously productive ecosystem which we revel in, whether on safari or more usually just watching TV – to the people we excluded. The Serengeti, it turns out, is man-made. But pause a minute and ask two questions? (1) Is Nature so impotent that she is incapable of generating diversity, or wild beauty for that matter, without a lending hand from Homo sapiens? (2) If the Serengeti had not been granted national park status but been left open to the pastoralists, cattle and wheat farms as in surrounding territory, how much of the ecosystem would survive today? I hope you agree it’s worth taking a closer look at the justification for national parks. But before doing so, I would like to forestall any wrong impressions by making clear that I am a supporter of conservation efforts outside of national parks. Not only do I believe them to be essential to the future of our wild heritage, but I think they embody the more important long-term challenge for conservation. I am also a supporter of national parks and here is why. 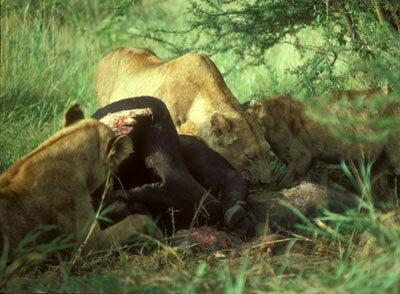 Lions feeding from the carcass of a Cape buffalo. This pride lived near our house in the Serengeti National Park and picked off the old bulls one by one. Firstly, in East Africa there is an inverse correlation between the number of pastoralists like the Maasai and the number of large wild mammals. In other words, the evidence of properly conducted surveys (and it’s easy to forget those dry reports when listening to the solemn words of sincere spokespeople on a documentary) show that wildlife and Maasai only coexist at low human density. There would be no ‘Serengeti’ today if there was no national park protecting it. Secondly, parks are the most successful tool (at least so far) in the rather ineffective conservationist’s tool kit for sustaining wildlife populations. This has been revealed by comparisons (more dry survey reports) of the changes in large mammal densities within and outside African parks over a period of several decades. Thirdly, when managed alongside a good community programme that helps local people, a well run national park will raise living standards and increase the diversity of livelihood options in surrounding areas. That is my personal experience, but I admit there are plenty of parks without such programmes. The community programme in the Serengeti has been a great success. In neighbouring Kenya, the Maasai choose to maintain the Mara Reserve partly because of the tourism revenue it generates. Fourthly, in the case of the grazing antelope (the wildebeest, zebra, hartebeest, waterbuck, reedbuck, oribi, gazelles, topi and so on) it should not be forgotten that all those wonderful beasts have been kicking their hooves in the African sun since well before hominids first set fire to grasses. We must presume that they enjoyed a combination of edaphic grasslands (created by natural conditions of soil and drainage) and dynamic grasslands (dependent on the combined effects of elephants, other browsers and natural fires) from well before the time of the first human hunter. In other words, many savannah areas in Africa would be filled with the din of migration and the roar of large predators even without human influence. We make a big splash wherever we go but we didn’t create African grasslands, grazing antelope or animal migrations! 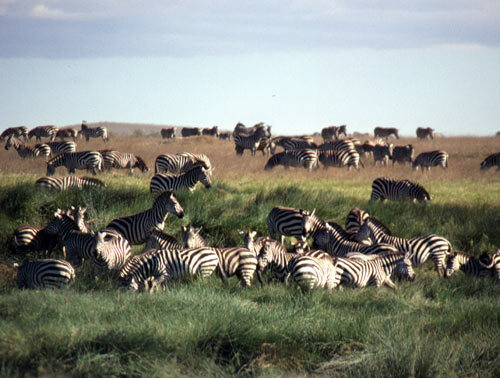 The short grass plains of the Serengeti are edaphic. Their fine volcanic soils quickly lose the little moisture that falls (only 300 mm per year or less in some parts) and the mineral hard pan is near the surface further inhibiting tree growth. Lastly, it’s worth bearing in mind an experiment that was attempted in Kenya back in the 1990s which I happened to observe at first hand. 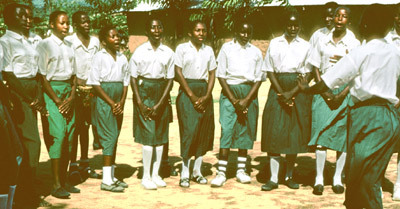 At that time part of the budget of the Kenya Wildlife Service was switched from national parks and the support of park rangers to conservation programmes outside of parks. The result was an uncontrolled outbreak of poaching within parks and a measurable decline in wildlife populations. 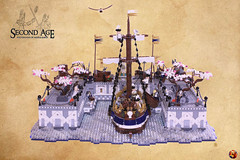 Morale in the ranger force collapsed. Eventually so many people complained that the experiment was brought to an abrupt halt. The budget was reversed and the ranger force given new direction. 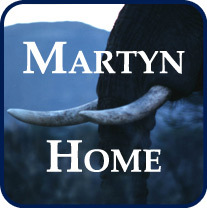 The poaching was brought under control and wildlife populations began to recover. The lesson is clear. We need our parks. So why, given the benefits of our national parks, do documentary-makers still like to knock them? I’ll leave that up to you to decide. For my part, I try to avoid choosing any particular narrative to plug. Or rather the narrative I select derives from one rule and one choice. I aim to be guided by facts (properly gathered data), and I put my hat in the ring with wildlife. I do the latter because, like Bernhard Grzimek, I thrill to the roar of lions at night, and the nibbling of gazelle by day. I think there is something very wholesome in having a few areas where we can experience natural (ish) ecosystems. I think it is good to be reminded of life that is free (ish) of human control. And I think it is important that there are places that inform us about ecological processes that ultimately, I believe, affect us all. This entry was posted in Conservation, Nature and tagged Africa, Serengeti. Bookmark the permalink.